In a weekend that saw four games, few Penguins took part in the festivities as the preliminary rounds continued on. One Penguin who did play stood out among the rest. The Czech Republic and Russia squared off again, this time in the Czech capital of Prague, where the Czech Republic excited the home crowd with a 2-1 shoot out win. The Penguins only representative, Evgeni Malkin, was a -1 in just around 17 minutes of action. Team Russia's next game will take place Wednesday at Consol Energy Center as they take on Team Canada at 7:30pm. Tickets are still available but they're not cheap. You can also watch the game on ESPN2. 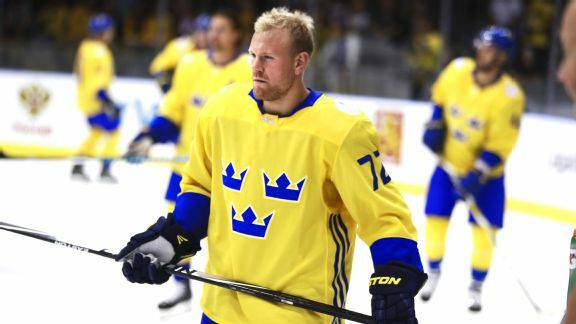 The Saturday's second game Team Sweden took to the ice in front of a home crowd in Gothenburg in hopes of showing off in front of the faithful the same way Team Finland did against their country in Thursday's overtime win. While Olli Maatta was the hero on Thursday's match up, a different Penguin stepped up in a big way on Saturday. It was the Patric Hornqvist show as he and his line mates, Filip Forsberg and Niklas Backstrom, accounted for 2/3 of Sweden's goals in a 6-3 win over Finland. Hornqvist himself had two goals and assists on two others. The highlight was easily the snipe seen above. Maatta was left off of the score sheet as was Carl Hagelin. On Friday Team USA took to the ice to show how physical and tough it could be and beat a Team Canada that wasn't playing at full speed, upsetting Team Canada 4-2. On Saturday Team Canada showed Team USA the other side of their cat and mouse game. With team captain Sidney Crosby a healthy scratch Team Canada they were able to rely on their exceptional depth to pile on the points in front of a game audience in Ottawa. A game that saw no other Penguins dress saw Canada beat the USA 5-2 as their power play clicked and they shrugged off Team USA's previous day's tough guy act. The final match up of the weekend proved to be quite entertaining as two teams consisting of multiple countries found their legs and found their scoring touches. Team North America, consisting of the best players under 23 in the United States and Canada, took on Team Europe, a team consisting of players from smaller European nations, to a 7-4 Team NA win. No Penguins played in the Team North America victory and no Penguins are on Team Europe's roster but Pittsburgh native John Gibson started in net over Penguins goalie Matt Murray and lead the way to victory. World Cup of Hockey action resumes on Tuesday night at 7pm Eastern. Team USA will take on Olli Maatta and Team Finland on the Mothership itself ESPN. Not ESPNU or ESPN3. We're talking ESPN!